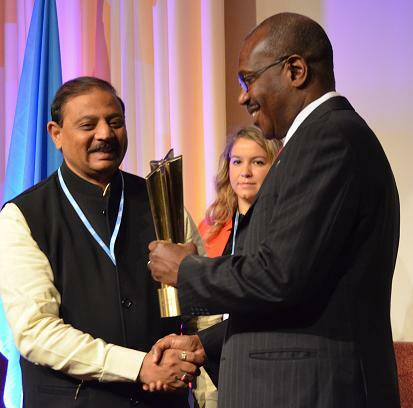 NICT CEO Receiving WSIS Project Implementation Prize 2013 from Secretary General ITU a UN organization on 13 May 2013, Geneva, Switzerland. A certificate of recognition for outstanding contribution towards strengthening the implementation of the World Summit on the Information Society (WSIS) outcomes. Network for Information and Computer Technology,Municipal Corporation Indore, Bank of India.